What is there to say about Elvis Presley that hasn’t already been said? It may be 41 years since the icon died tragically at only 42 years old but his music continues to live on, and likely will forever. It’s actually mind-blowing to think that his music has survived for almost as long as he was alive. In 2002 Sony Music released a new greatest hits collection titled ELV1S: 30 #1 Hits, which dominated charts across the world and sold millions and millions of copies. The set sold almost 2 million in the UK alone, proving just how popular The King still is. 16 years on from its original release, ELV1S: 30 #1 Hits has been reissued on 2LP vinyl. Taking inspiration from the album cover, the release has been pressed on gold vinyl making the whole package feel very special. The track listing for ELV1S: 30 #1 Hits was compiled by Ernst Mikael Jorgensen and Roger Sermon using chart data from a number of sources. The result is a somewhat definitive collection of Presley’s music taking in 30 songs that hit number one in either the US or the UK, along with the Junkie XL remix of a Little Less Conversation, which gave Presley a posthumous number one. Presley was an incredibly prolific artist so getting this collection down to 31 tracks was no easy feat. What was achieved with ELV1S: 30 #1 Hits though, is a collection that gives you all the highlights you need from The King’s career to showcase the incredible impact he had on music. The album opens with Heartbreak Hotel and there isn’t a single filler track here. Presley could turn his hand to pretty much everything whether it was rock ‘n’ roll (Hound Dog), ballads (Don’t), gospel (In The Ghetto) or rhythm and blues (Return to Sender). It’s actually near impossible to pick out highlights across the 2LPs because every single one of these songs is a classic. It’s Now Or Never managed an incredible 8 weeks at the top of the charts here in the UK, making that track his longest-running number one on this side of the pond, followed by All Shook Up, which managed 7 weeks. Personally my favourites are A Big Hunk O’ Love, which saw Presley embrace his rock ‘n’ roll side, the gorgeous almost Country She’s Not You, and the uptempo and punchy Burning Love. Of course no Elvis collection would be complete without Suspicious Minds and that track is near the end of the track listing on the final side. 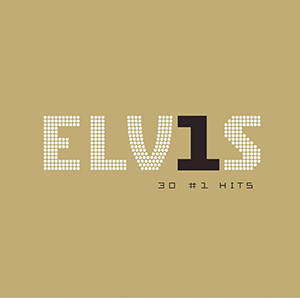 ELV1S: 30 #1 Hits is a must-have release for any Elvis Presley fan. While he had plenty of great songs that aren’t featured here, this collection truly is the definitive one to own. There’s not a single bad song here and it’s lengthy enough to give you value for money. The whole vinyl package is fantastic and it looks as good as it sounds. They don’t make artists like Elvis anymore and they probably never will again.